What can you expect from the fall real estate market on the Outer Banks? One thing is for sure…activity! So far this year, the number of properties going under contract for the area is up by 7%. That means we have buyers! While inventory levels still continue to drop, we do have over a year of inventory still plaguing us (13.5 months). So, even with the number of sales up and number of listings down, it would still take over one year to sell off all the property currently on the market. So, why list your home this fall? Because it can sell! Yes, it means you have to price it right to compete in today’s market. The truth is, with more buyers than last year, if the property hasn’t sold, it’s likely over priced. In a market full of options for buyers, only two things really matter…price and condition. We’ve noticed that buyers today don’t want to put up the large down payment, and then immediately dump a bunch of money into the home to bring it into the 21st century. If your home still screams 80’s or 90’s, it will go to the bottom of the list, unless the price is super attractive. I’ve personally seen buyers bypass a home with better location that hasn’t been updated, to go further back to a home that has. Please don’t shoot the messenger! I don’t make the rules, I just report them. Buyers want a discount because the rental income is basically over. The number of sales will increase over summer by about 18% to 20%. Many buyers will need to buy something before the end of the year. Listing inventory will go up about 12% to 15%, so your home will have a bit more competition. Price it right, so you sell first. Buyers who got the itch to buy this summer will be back to take a closer look now that homes are available to show. Many buyers like to take the time between now and next spring to make changes to the home and personalize it. If you’re thinking about selling your Outer Banks home, give me a call to discuss it. I will do a free market analysis for you. If you’ll likely be here in the next 60 days, let’s meet! Dare County’s preliminary flood maps were officially released on Thursday, June 30th and info on the maps can be found on Dare County’s website at www.darenc.com or directly through the FRIS website. A presentation on the preliminary maps was given by Steve Garrett from the NC Floodplain Mapping office at the last Dare Board of Commissioners meeting. Base flood elevations throughout Dare County are going down in most areas. Some base flood elevations are going down in areas like Wanchese by as much as 5 feet and many properties currently in an AE zone are now mapped into an X zone. Mr. Garrett’s presentation can be found at around the 33 minute mark. Mr. Garrett presents information on how to access the web site and shows you how to find the current effective map information as well as the preliminary map data. The base flood elevation changes will impact flood insurance rates and building requirements when the preliminary maps become effective in 18 to 24 months. Properties showing reduced base flood elevations and /or a change to a lesser risk flood zone may find that garages that are not covered by insurance under current maps will be covered under the updated maps; bathrooms and other rooms that are not allowed now due to an area being below base flood elevation will be allowed under the updated maps. For example, Mr. Garrett showed 12,875 properties in unincorporated Dare County currently in an AE zone. Under the revised preliminary maps, only 8,493 properties are in an AE zone. That number drops dramatically in Kill Devil Hills too, with 4,389 properties currently in an AE zone but under the revised maps, only 182 properties will be in an AE zone. The same scenario holds true for Dare County’s five other towns. When going to the fris.gov site, select the state of NC; click OK when the Welcome box appears. Then select Dare County from the map or from the drop down menu. You can click on a particular structure by searching by address; however, if you do not enter the address exactly the way appears in the system, then the address will be invalid. All Southern Shores addresses are entered as Kitty Hawk. The box in the right top corner will show “Effective” or current map info. Once a property is clicked on then you can see the current elevation and zone. Click on the top right corner box and change “Effective” to “Preliminary” to see the revised map information. Click on the “Flood Information” box to see the new base flood information and zone information. There are two new zones – “AH” and “AO” which represent shallow flooding areas. AH zone applies strictly to Kitty Hawk. AO represents areas of shallow flooding of 1 to 3 feet. The preliminary maps were developed by the NC Floodplain Mapping office using grant funds from the Federal Emergency Management Agency and were developed over a period of years using the latest GPS and Lidar technology as well as historical storm data up to Hurricanes Dennis and Floyd. While the new maps may show a lower base flood elevation or a change to a lesser risk flood zone, it is important to maintain coverage and discuss flood insurance coverage options with your insurance agent. After all, the Outer Banks is surrounded by water! Also, while a property may be coming out the Special Flood Hazard Area altogether(X zone) and not be required to maintain flood insurance therefore eligible for Preferred Risk coverage when new maps become effective; the premium may actually be higher than what a policyholder is currently paying. Since it is going to take some time before new maps become effective, we will be keeping you updated and informed on the progress! Although it sounds reasonable to think with all the guests coming, it would be better to just sell the home in the fall or spring, take a look at these 5 reasons you could be missing out by waiting. Inventory has been our biggest challenge in terms of pricing. June, July and August are historically the time of year when our inventory is the lowest. Why not take advantage of that incredible opportunity? Lower inventory means higher prices. The Outer Banks will have over 3 million visitors each year. Obviously the majority of those folks visit during the summer months. We cannot get that kind of exposure any other time of year! The home is fully open and operational. Buyers will have inspections done before closing. When the house is winterized during the fall/winter, there are extra costs to open the house back up for those inspections. Right now, everything is up and running and easy to inspect to assure the buyer the home is in good condition. It’s a beach house! When does the beach look the best? Summer time of course. Your beach house will show the best with sun shining, deck chairs out, pool open, hot tub running! Buyers get excited about these things and it helps to sell your home. Buyers this time of year are serious about buying! If a potential buyer is going to take time out of their much anticipated vacation to look at your home, it means they are serious about buying. They’re here with all decision makers too. If you would like to know what your home is worth in today’s market, or want to see my marketing plan, call or email me today! So I was reading the latest statistics prepared by our Association, which is an amazing service they provide, and I started to get a little excited! The report is that Average and Median Sales Price are up! I looked deeper into each Town and area, and noticed a few really bright spots in our market…according to the Median sales price. One challenge with the data is the comparison is for the entire year of 2015, to just the first 4 months of the year. Not exactly apples to apples. However, a few locales are showing significant increases in Median Sales Price. Does that mean prices are finally starting to go up? Sadly, not really. What it does mean is that consumer confidence is strong, so there are more homes selling in the upper price ranges than the previous time period. That is still a very good sign. If that continues, and inventory levels have a chance to straighten out, we could then see prices rising again. The bottom line truth is the basic principle of supply and demand will always dictate our pricing structure. There is no way around it, I’m afraid. So if you see reports of our market prices rising…just remember it means more homes in the higher price ranges are selling, not necessarily that prices are going up. When our area still has 17 months of inventory, it’s hard to imagine that environment producing rising prices. One other item I considered was, are there fewer homes for sale in the lower price ranges, causing people to buy in the higher price range? Take a look at a few of the examples below. *Also important to note the difference in pricing of the over $901,000 – in 2016, there were 6 sales over $1,200,000 versus 2015, only 2. In 2015 the lowest home sale was $218,000 and 6 under $300,000. In 2016 the lowest sale was $102,000 and there were 8 under $300,000. Hard to make a case for a 2% increase in price with that data. So…As you can see from the numbers above, the higher end sales are seeing a nice surge. I promise, as soon as prices start to rise, you’ll be the first to know! Meanwhile, I’m still very excited that consumer confidence is increasing, and Jumbo loans are clearly not an issue. Rates are still under 4%, which is amazing. The bottom line is, as always, if you want to sell your home, we can do it! If you’re thinking of investing, the time is right! True to history, we are already seeing a spike in sales for this month. In just the first 17 days we already have 20% more homes under contract than last March. That’s very exciting news. On the other hand, what we also have is over a year of inventory. The basic principle of supply and demand just simply will not allow prices to rise. Inventory is too high for the number of buyers in the market. Prices will continue to be affected. I’ve been saying for 5 years, that if you want to wait for prices to go up to sell your home, you’ll be waiting at least 3 to 5 years. Well, after 5 years, prices still haven’t gone up. So now, I’m saying 7 to 10 more years. Sadly, it’s just going to take that long based on the statistics. Real estate is a long-term investment. If you’re in the market to buy now and plan to own the home for 10 to 20 years, don’t worry. You’ll be fine. If you’re still on the fence about selling, just consider the cost to own your home for the next 10 years, versus pricing it to sell now. Then ask yourself a very serious question…Is it more important to get your price, or to get the home sold? Exactly how much longer do you want to own this home? If you’re waiting on price, it could be a while. If I can help you answer any questions about buying or selling, please let me know. 2015 was a good year for real estate. Overall the market finished with an 11% increase in the number of homes sold. While we still have some work to do, there are very good signs for a lot of the area. Leading the category of still in much need for improvement is Corolla. Not far behind is the Town of Duck. The main reason these markets are still showing huge inventory levels and decreasing prices is the lack of a primary market. In these two locations, 99% of sales are discretionary. These sellers don’t HAVE to sell and the buyers don’t HAVE to buy. They are secondary homes. Without a primary market to stabilize things, the inventory in both areas has remained out of control. It will be interesting to see how long it will take to get inventory levels to a normal absorption rate of 6 months or less. It certainly won’t happen quickly. I think the most notable stat to recognize is the 25% increase in the number of homes sold for Corolla last year. That’s interesting because in most of 2015 there was a 20 to 21 month supply of homes for sale. Even AFTER a 25% increase in homes sold, there is STILL TODAY a 19 month supply of homes for sale. Let that sink in for a minute. You’ll notice a slight increase in average sold price above. Yet, I mentioned that prices are still dropping. How can that be? If we look a the breakdown below, you’ll notice there were fewer homes sold under $500,000 and more homes sold over $500,000. That can skew the average price. What we do know is the average home in Corolla goes through 3 price reductions before selling, as well as over 200 days on the market. Both are signs of continued price decline. What’s interesting for Duck is the very clear shift in lower priced homes selling. The jump in homes sold from $350,000 to $500,000 was massive! Notice also, the drop in homes sold in the higher priced categories. Going into 2015, Southern Shores was showing great numbers. I’m not sure what changed throughout the year, but they didn’t end as strongly as they started. Another Town with a huge increase in homes selling under $350,000 and a drop in sales of those higher priced. Very interesting to see what will take place in 2016 for Southern Shores as it’s still a very sought after location. You’ll notice quite a few differences with these Town stats than the northern beaches. Once again we go back to having a primary market. These areas have been largely helped and stabilized for that reason. The major news in the southern beaches for price range stats is the increase in homes selling from $350,000 to $500,000. The rest remained fairly unchanged. It’s my expectation that we will see similar numbers in 2016. I’m not predicting another year with double digit increases in number of homes sold. However, it would be lovely to see some serious stabilization in pricing for the northern beaches. I’m not sure that’s possible with the oversupply of inventory, but it’s on my wish list! If I can help you with buying or selling on the Outer Banks, let me know! 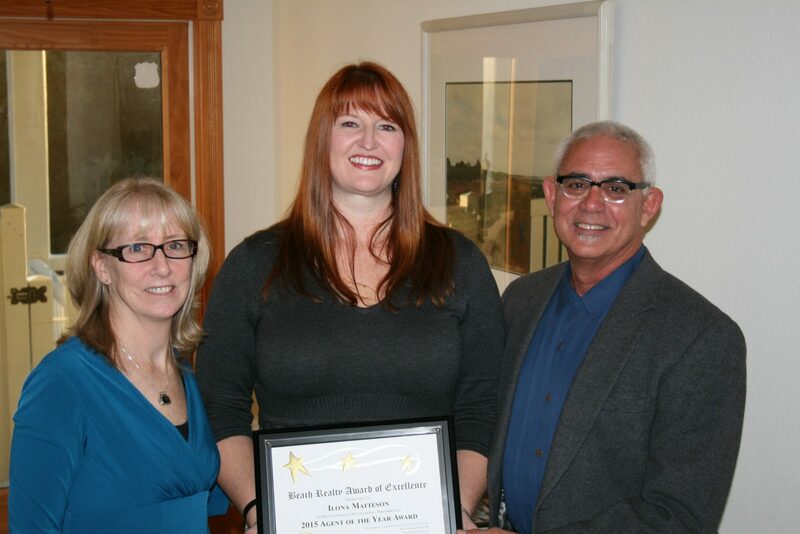 From left to right: Beth Urch, Sales Manager, Ilona Matteson, and Jimbo Ward, President. Ilona Matteson, associate broker for Beach Realty & Construction / Kitty Hawk Rentals was named the company’s agent of the year for 2015. Ilona also earned agent of the year honors in 2012. Ilona was licensed in the late 1990’s and became sales manager for Beach Realty in 2002. In 2006, she moved to Richmond, VA and was affiliated with a national coaching company where she excelled as a one-on-one coach for real estate professionals. The allure of the Outer Banks brought her back to the beach and she resumed her career in real estate sales. She quickly became a top producer and attributes her success to hard work, discipline and in-depth knowledge of the local market. Along with her successful career in real estate sales, Ilona also offers training and coaching to the sales team at Beach Realty & Construction. You can reach Ilona Matteson in the Duck office of Beach Realty & Construction/ Kitty Hawk Rentals at (252) 261-6600 or email [email protected]. Beach Realty & Construction/Kitty Hawk Rentals is a full-service real estate company offering an attractive and ethical environment for licensed real estate professionals to realize a successful career. For more information about joining the Beach Realty sales team contact Sales Manager, Beth Urch at (252) 261-3815 or [email protected]. We saw a lot of very positive signs in 2015 that continue to lead us on the path to recovery. While we still have an oversupply of inventory on the market, keeping prices down, we have a double digit increase in number of sales. The other interesting trend is showing more homes in the higher price ranges are selling and fewer homes offered in the under $300,000 price range. That is showing our median sales price to be up, even though individual home prices aren’t rising at this point. It’s virtually impossible for our home values to go up when inventory is still at a 15 month supply. However, it’s a great step forward. We saw a 20% increase in number of sales for 2012, then it steadied for 2 years until another big increase in sales for 2015. Mortgage brokers are expecting a surge in activity the first part of 2016 to beat the Fed’s promise of rising interest rates. We certainly have a year round market on the OBX and see great activity all year long. The two spikes in activity happen in March/April and September/October. No need to wait though, we can get your home sold any time of year. Next month I’ll provide a break down of each location individually so you can see how it compares year over year. If you have any questions or would like additional information please let me know. The following information is copied with permission from the Outer Banks Association of REALTORS(R) . Currituck County’s PRELIMINARY updated flood maps have been released. Information pdf on how to access the site. The link will take you to the flood map FRIS page, click on ok and then select the County (Currituck).In the upper right corner you will see “effective”. Go there and select “preliminary”. You will be able to look at the new proposed maps that will hopefully be adopted within the next year. ‪Current maps show 7,020 buildings in the A Zone; new maps show 2,767 buildings the A Zone. There are oceanfront V Zone properties that are coming completely out of the special flood hazard area – being changed to an X Zone! Please keep in mind that these are only preliminary maps. They will have to undergo a 90-day appeal process, a public meeting process and final FEMA approval. This entire process could take up to 18 months. In the meantime – good news overall for homeowners in the special flood hazard area!